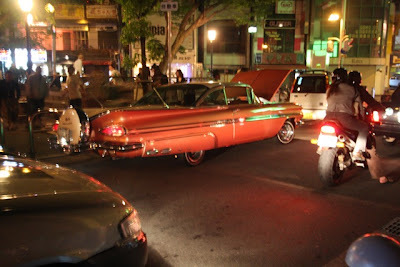 McAlpine of The Soul of Japan blog took s few photos of the custom car scene in Osaka at three in the morning. One point I want to make is that, most low rider crews in Kanagawa where I live are not popular with the ladies Most young girls from that part of Japan, and even in Tokyo would never be caught riding around in these types of cars. Not the case in Osaka, though. I was so surprised to see so many incredibly beautiful women riding around with their boyfriends in these gangster type cars.